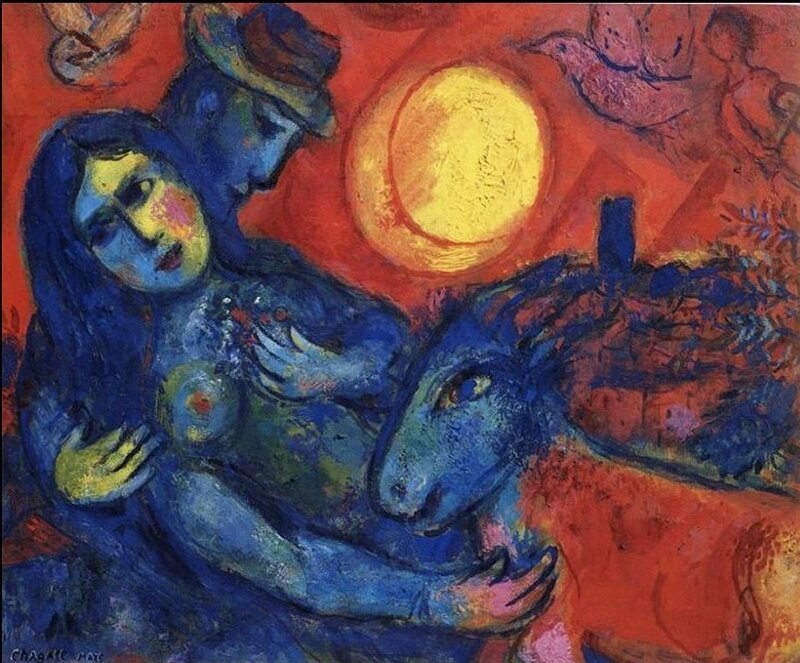 Marc Chagall, (born July 7, 1887, Vitebsk, Belorussia, Russian Empire [now in Belarus]-died March 28, 1985, Saint-Paul, Alpes-Maritimes, France), Belorussian-born French painter, printmaker, and designer. He composed his images based on emotional and poetic associations, rather than on rules of pictorial logic. Predating Surrealism, his early works, such as I and the Village (1911), were among the first expressions of psychic reality in modern art. His works in various media include sets for plays and ballets, etchings illustrating the Bible, and stained-glass windows. 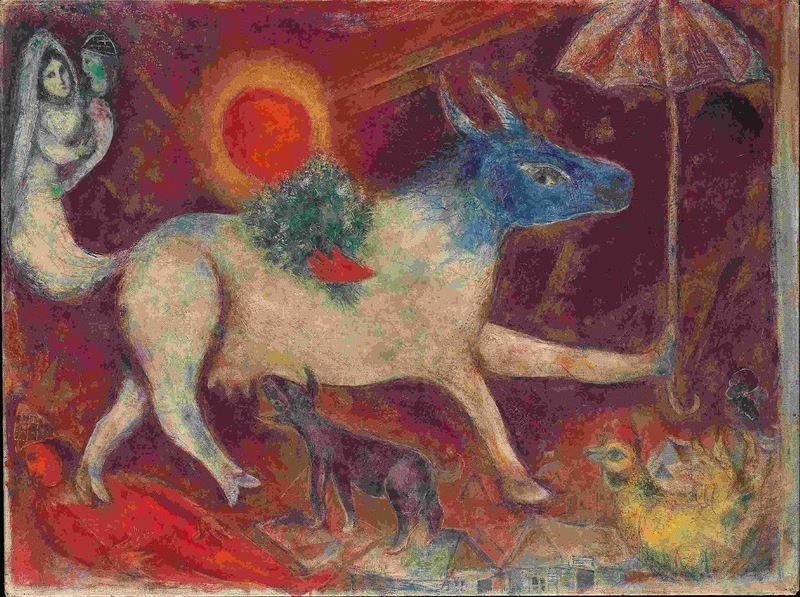 Chagall was born in a small city in the western Russian Empire not far from the Polish frontier. His family, which included eight other children, was devoutly Jewish and, like the majority of the some 20,000 Jews in Vitebsk, humble without being poverty-stricken; his father worked in a herring warehouse, and his mother ran a shop where she sold fish, flour, sugar, and spices. 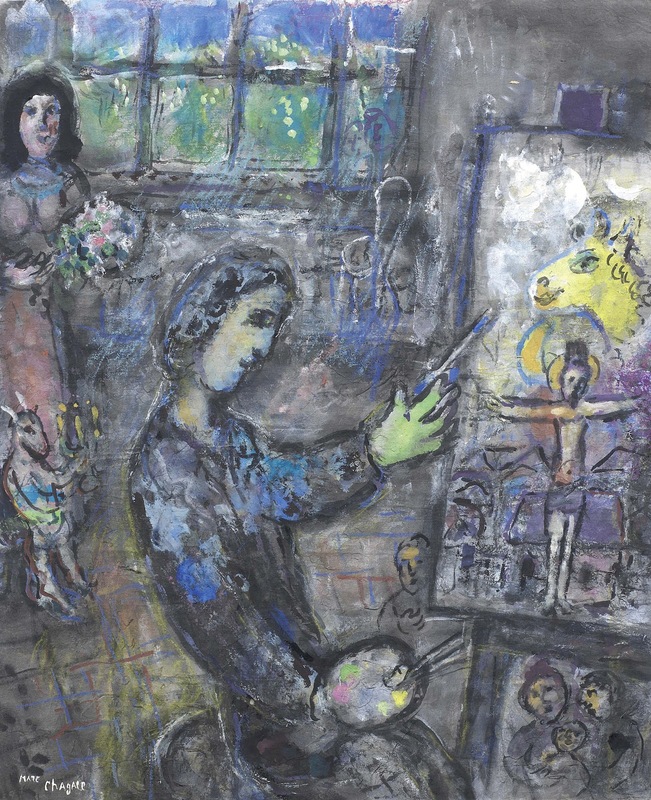 The young Chagall attended the heder (Jewish elementary school) and later went to the local public school, where instruction was in Russian. After learning the elements of drawing at school, he studied painting in the studio of a local realist, Jehuda Pen, and in 1907 went to St. Petersburg, where he studied intermittently for three years, eventually under the stage designer Léon Bakst. Characteristic works by Chagall from this period of early maturity are the nightmarish The Dead Man (1908), which depicts a roof violinist (a favourite motif), and My Fiancée with Black Gloves (1909), in which a portrait becomes an occasion for the artist to experiment with arranging black and white. 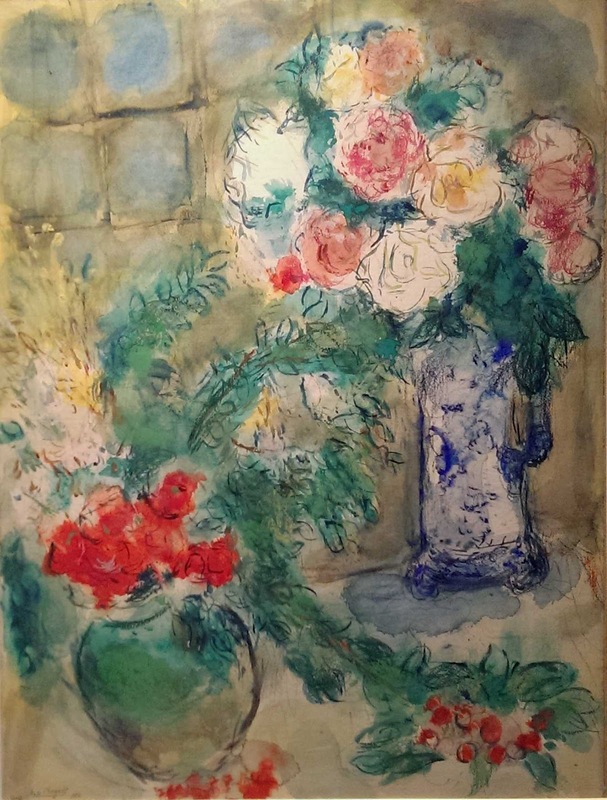 In 1910, with a living allowance provided by a St. Petersburg patron, Chagall went to Paris. After a year and a half in Montparnasse, he moved into a studio on the edge of town in the ramshackle settlement for bohemian artists that was known as La Ruche (“the Beehive”). 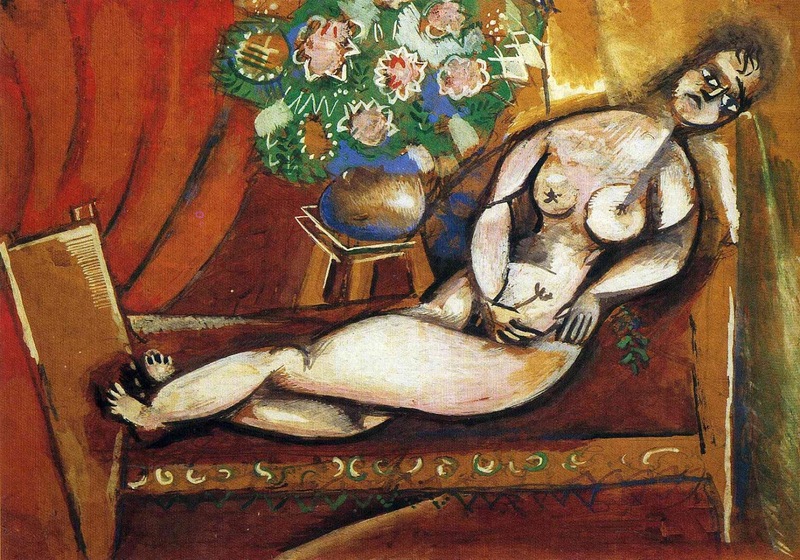 There, he met the avant-garde poets Blaise Cendrars, Max Jacob, and Guillaume Apollinaire, as well as a number of young painters destined to become famous: the Expressionist Chaim Soutine, the abstract colourist Robert Delaunay, and the Cubists Albert Gleizes, Jean Metzinger, Fernand Léger, and André Lhote. In such company nearly every sort of pictorial audacity was encouraged, and Chagall responded to the stimulus by rapidly developing the poetic and seemingly irrational tendencies he had begun to display in Russia. At the same time, under the influence of the Impressionist, Post-Impressionist, and Fauvist pictures he saw in Paris museums and commercial galleries, he gave up the usually sombre palette he had employed at home. 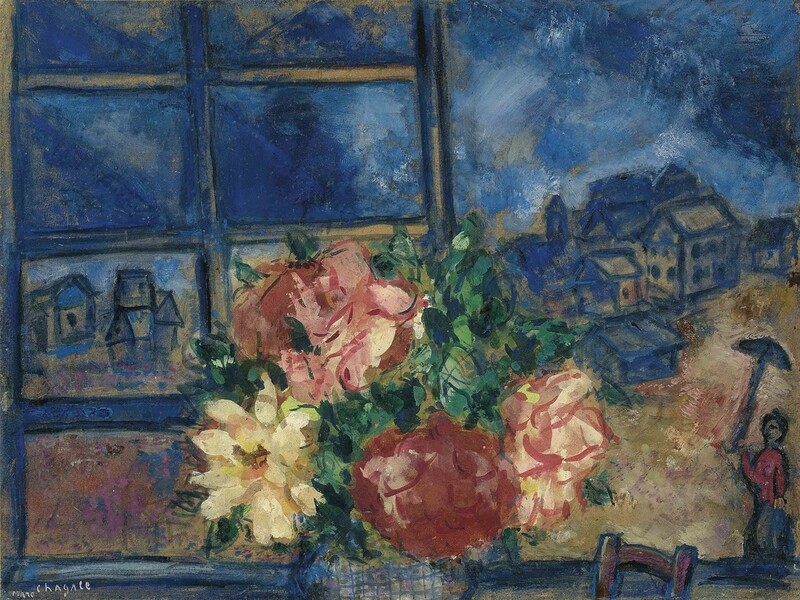 The four years of his first stay in the French capital are often considered Chagall’s best phase. 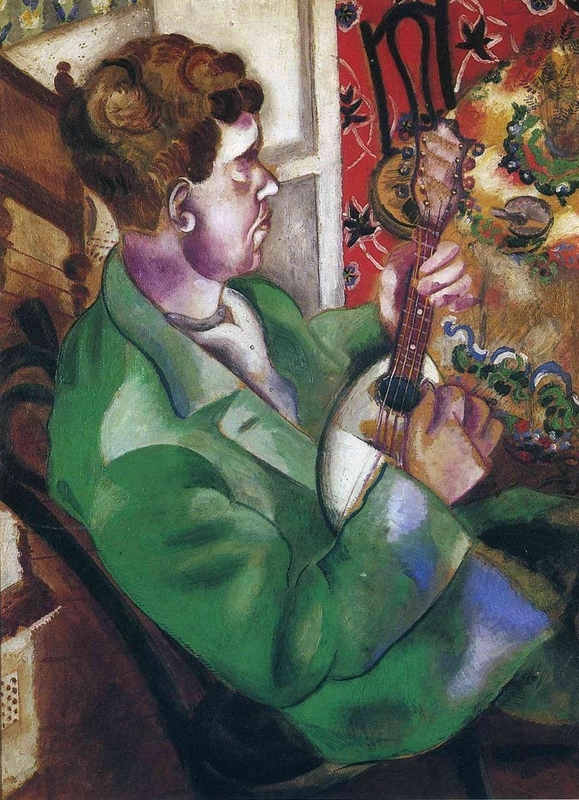 Representative works are Self-Portrait with Seven Fingers (1912), I and the Village (1911), Hommage à Apollinaire (1911-12), Calvary (1912), The Fiddler (1912), and Paris Through the Window (1913). 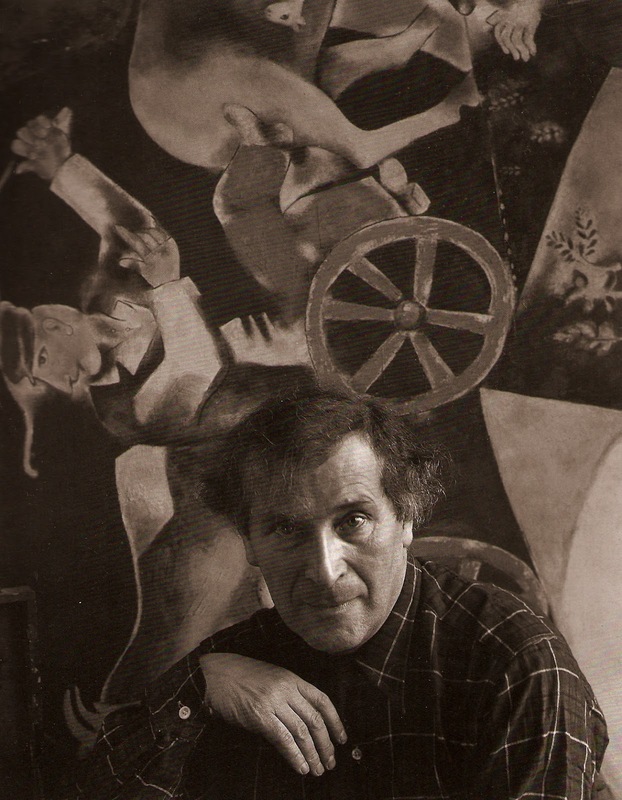 In these pictures Chagall was already essentially the artist he would continue to be for the next 60 years. His colours, although occasionally thin, were beginning to show the characteristic complexity and resonance he would eventually achieve. 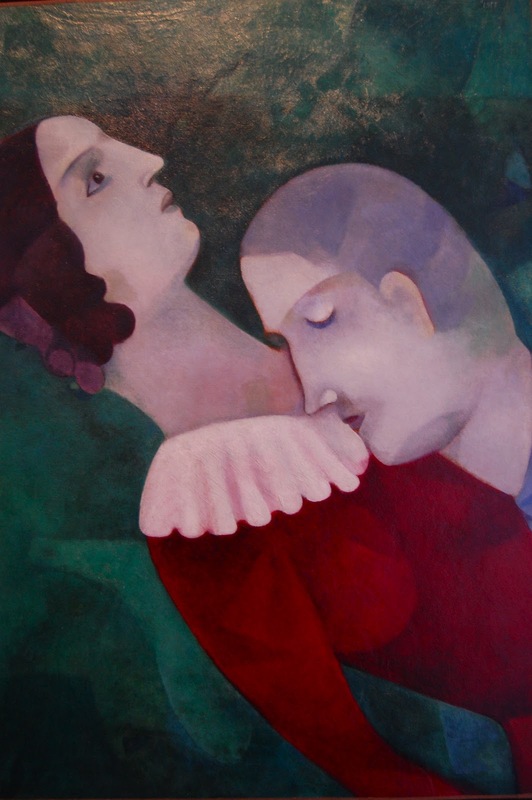 The often whimsical figurative elements, frequently upside down, are distributed on the canvas in an arbitrary fashion, producing an effect that sometimes resembles a film montage and suggests the inner space of a reverie. 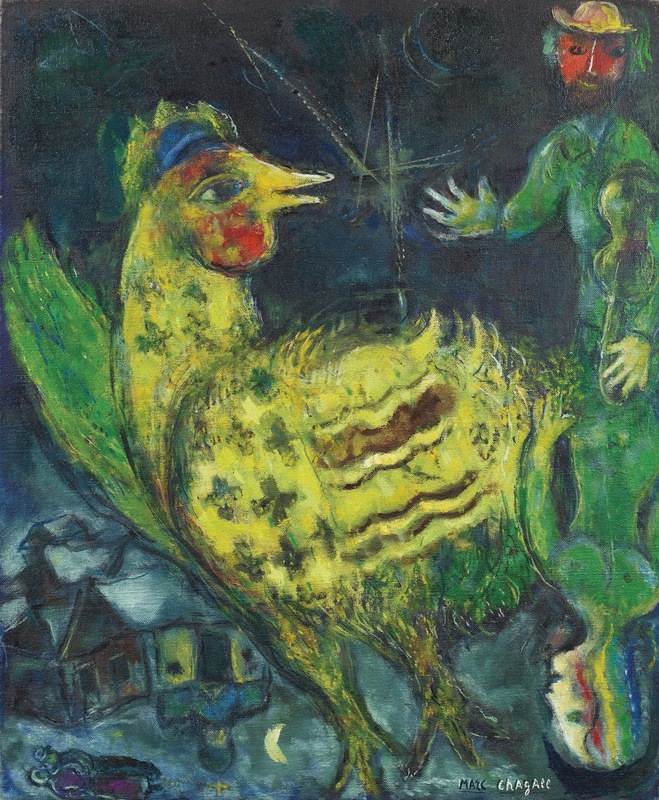 The general atmosphere of these works can imply a Yiddish joke, a Russian fairy tale, or a vaudeville turn. 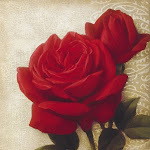 Often the principal character is the romantically handsome, curly-haired young painter himself. 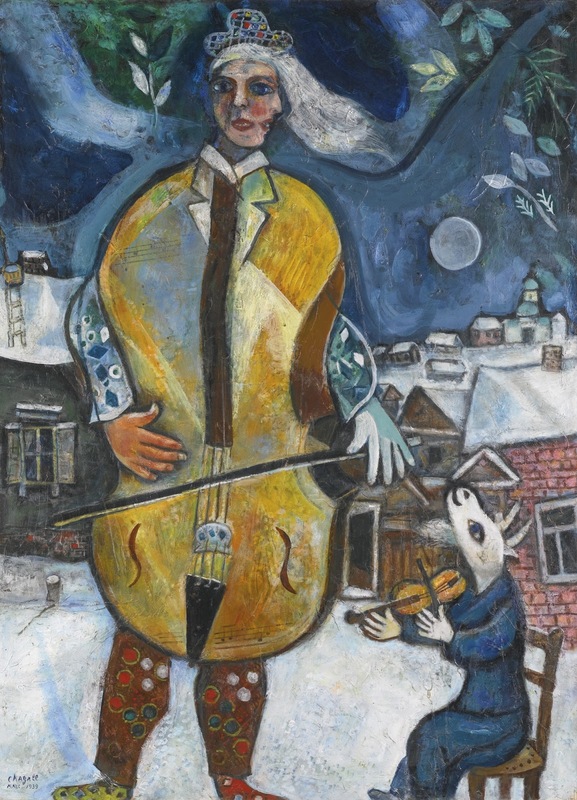 Memories of childhood and of Vitebsk were major sources of imagery for Chagall during this period. 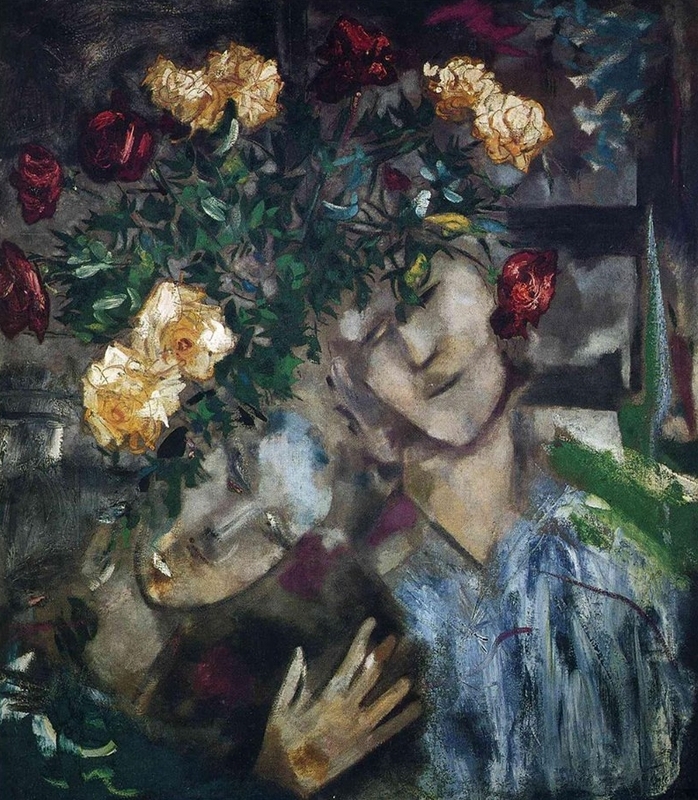 After exhibiting in the annual Paris Salon des Indépendants and Salon d’Automne, Chagall had his first solo show in Berlin in 1914, in the gallery of the Modernist publication Der Sturm, and he made a strong impression on German Expressionist circles. After visiting the exhibition, he went on to Vitebsk, where he was stranded by the outbreak of World War I. 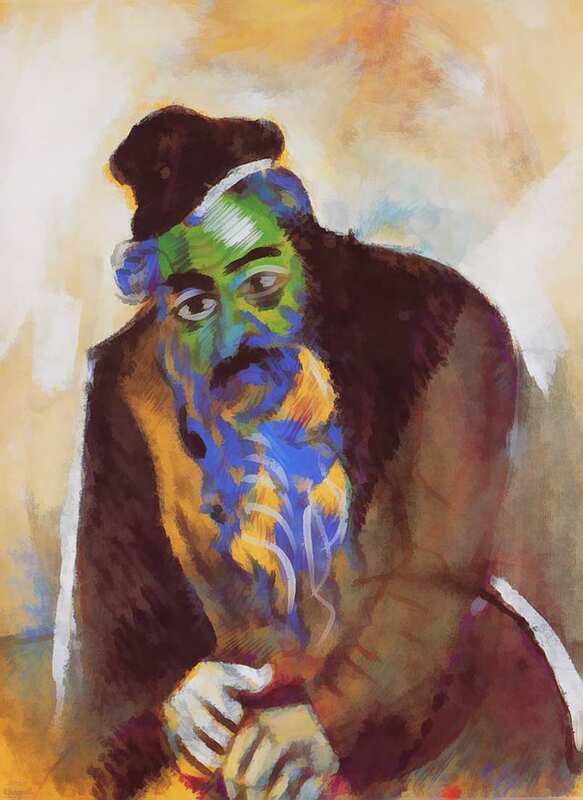 Working for the moment in a relatively realistic style, Chagall painted local scenes and a series of studies of old men; examples of the series are The Praying Jew (or The Rabbi of Vitebsk, 1914) and Jew in Green (1914). 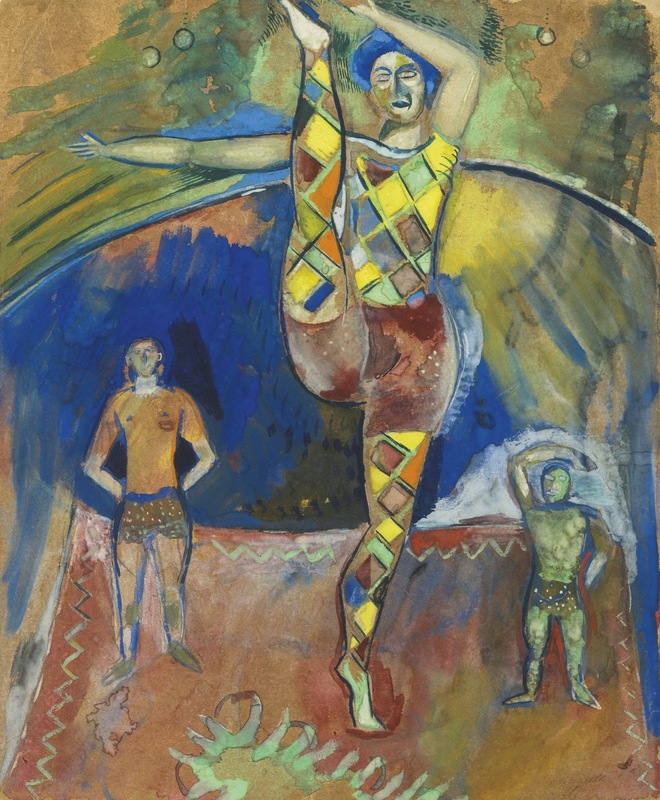 In 1915 he married Bella Rosenfeld, the daughter of a wealthy Vitebsk merchant; among the many paintings in which she appears from this date onward are the depiction of flying lovers entitled Birthday (1915-23) and the high-spirited, acrobatic Double Portrait with a Glass of Wine (1917). 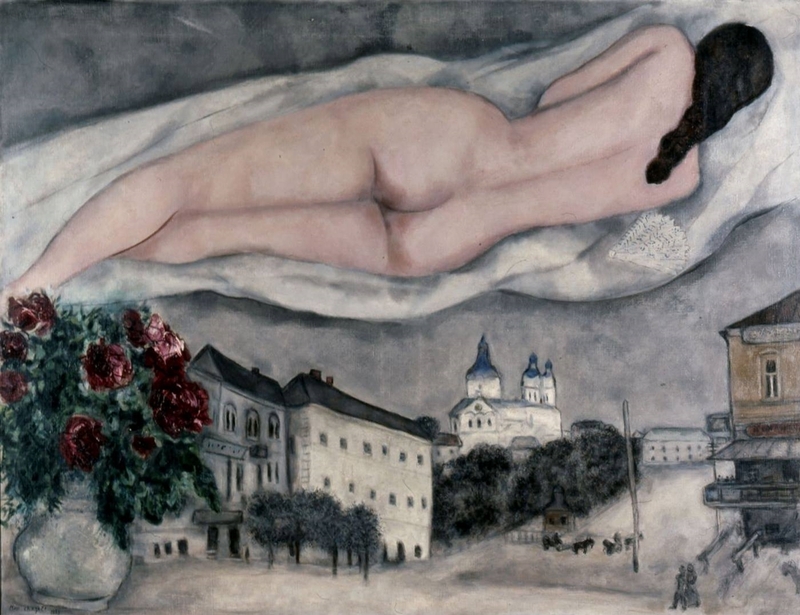 Chagall was initially enthusiastic about the Russian Revolution of October 1917; he became commissar for art in the Vitebsk region and launched into ambitious projects for a local art academy and museum. But after two and a half years of intense activity, marked by increasingly bitter aesthetic and political quarrels with the faculty of the art academy, he gave up and moved to Moscow. 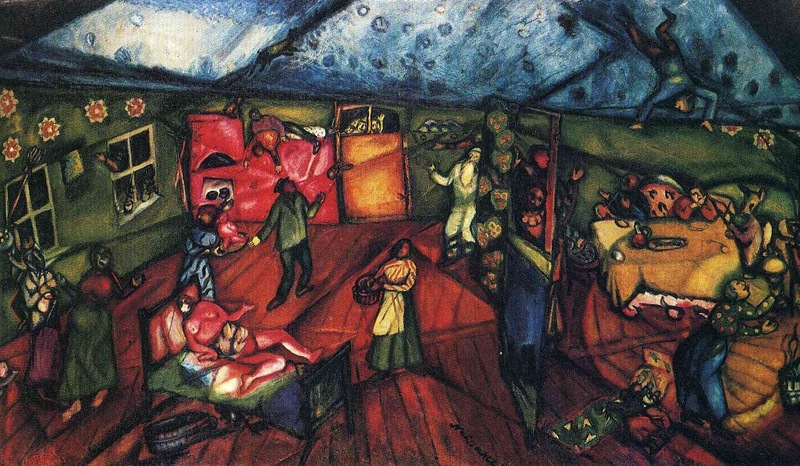 There he turned his attention for a while to the stage, producing the sets and costumes for plays by the Jewish writer Sholem Aleichem and murals for the Kamerny Theatre. 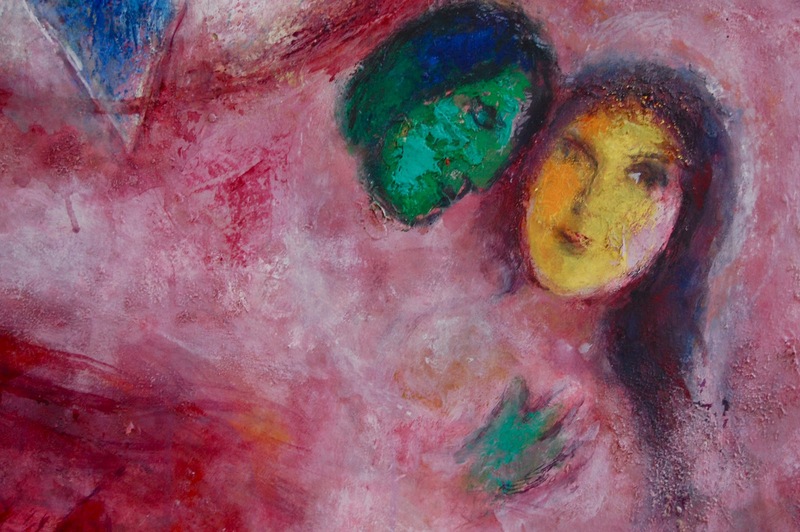 In 1922 Chagall left Russia for good, going first to Berlin, where he discovered that a large number of the pictures he had left behind in 1914 had disappeared. In 1923, this time with a wife and daughter, he settled once again in Paris. 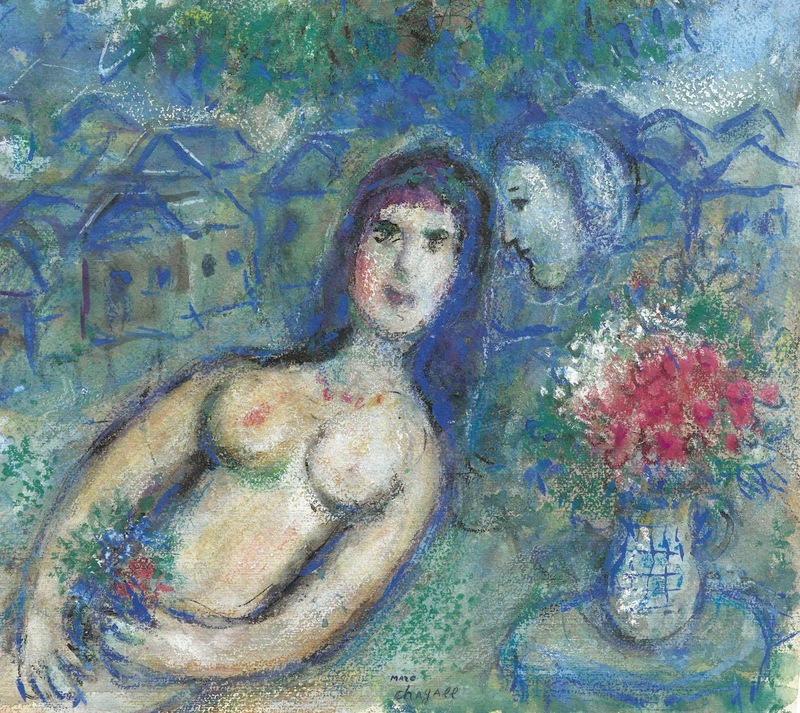 Chagall had learned the techniques of engraving while in Berlin. Through his friend Cendrars he met the Paris art dealer and publisher Ambroise Vollard, who in 1923 commissioned him to create a series of etchings to illustrate a special edition of Nikolay Gogol’s novel Dead Souls, and thus launched Chagall on a long career as a printmaker. 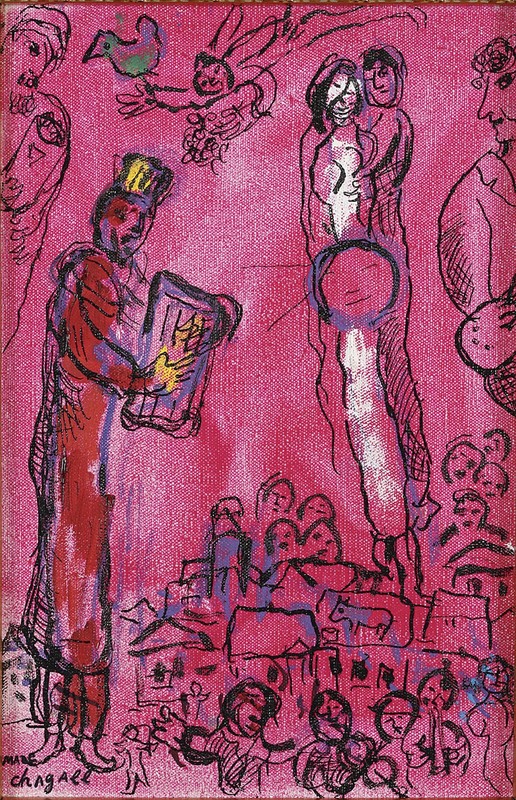 During the next three years, Chagall executed 107 full-page plates for the Gogol book. By then Vollard had a new idea: an edition of French poet Jean de La Fontaine’s Fables, with coloured illustrations resembling 18th-century prints. 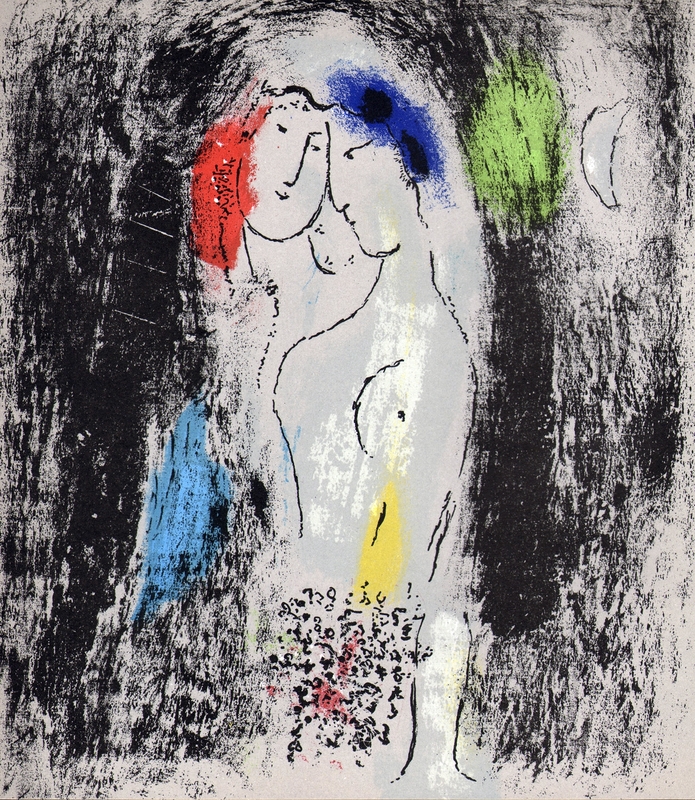 Chagall prepared 100 gouaches for reproduction, but it soon became evident that his colours were too complex for the printing process envisaged. He switched to black-and-white etchings, completing the plates in 1931. By this time Vollard had come up with still another commission: a series of etchings illustrating the Bible. 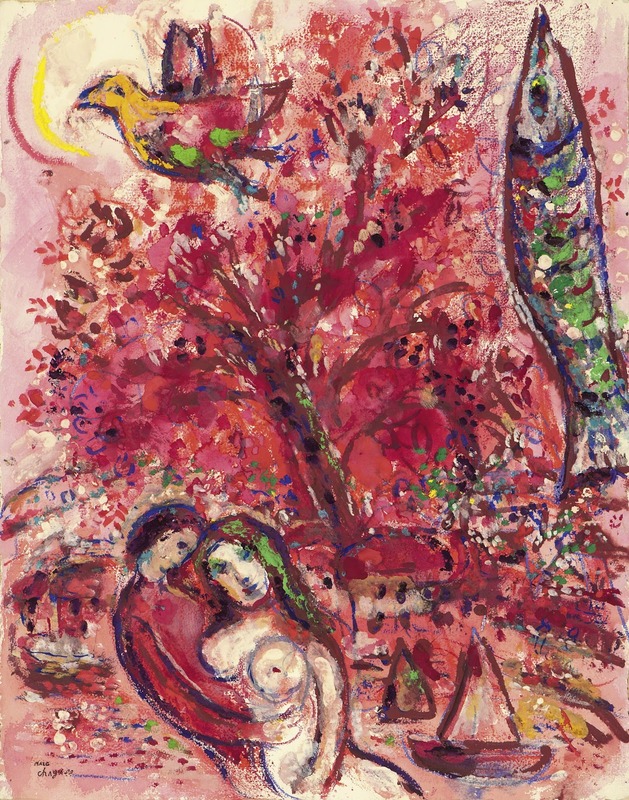 Chagall had completed 66 plates by 1939, when World War II and the death of Vollard halted work on the project; with the project renewed in the postwar years, Chagall eventually completed 105 plates. The Paris publisher E. Tériade, picking up where Vollard had left off, issued Dead Souls in 1948 (with 11 more etchings for the chapter headings, making 118 in all), La Fontaine’s Fables in 1952 (with two cover etchings, making 102 in all), and the Bible in 1956. 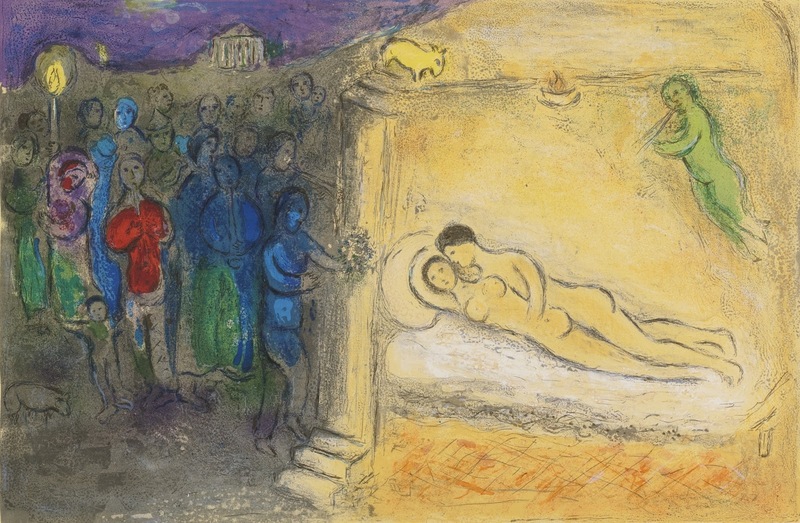 Along with these much delayed ventures, in the 1920s Chagall also produced a number of smaller collections of engravings, many single plates, and an impressive quantity of coloured lithographs and monotypes. 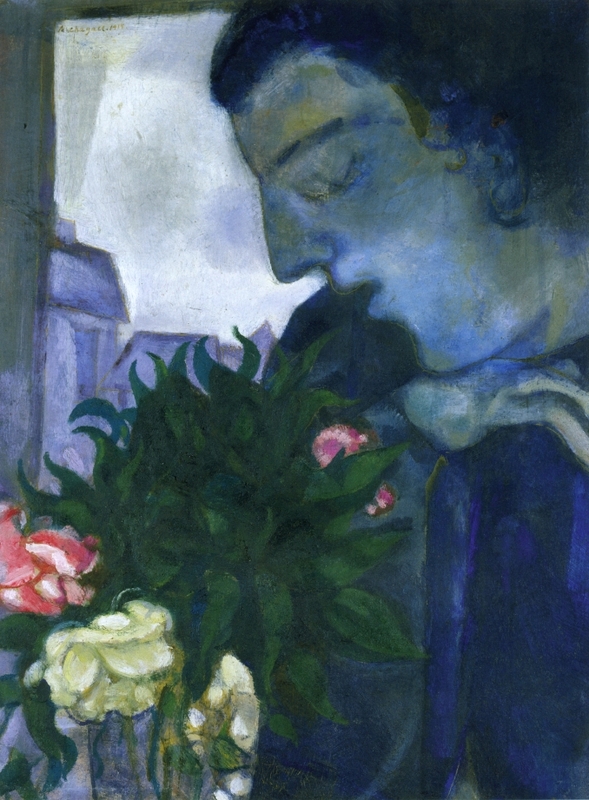 During the 1920s and early ’30s, Chagall painted fewer large canvases, and his work became more obviously poetical and popular with the general public. Examples are Bride and Groom with Eiffel Tower (1928) and The Circus (1931). 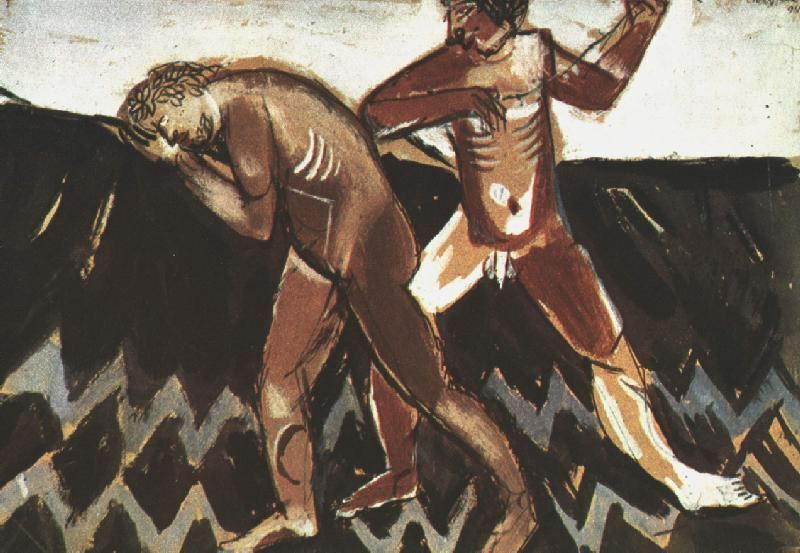 With Hitler’s rise to power, however, and the growing threat of a new world conflict, the artist began to have visions of a very different sort, which are reflected in the powerful White Crucifixion (1938). In this painting, Jewish and Christian symbols are conflated in a depiction of German Jews terrorized by a Nazi mob; the crucified Christ at the center of the composition is wrapped in a tallith, a Jewish prayer shawl. 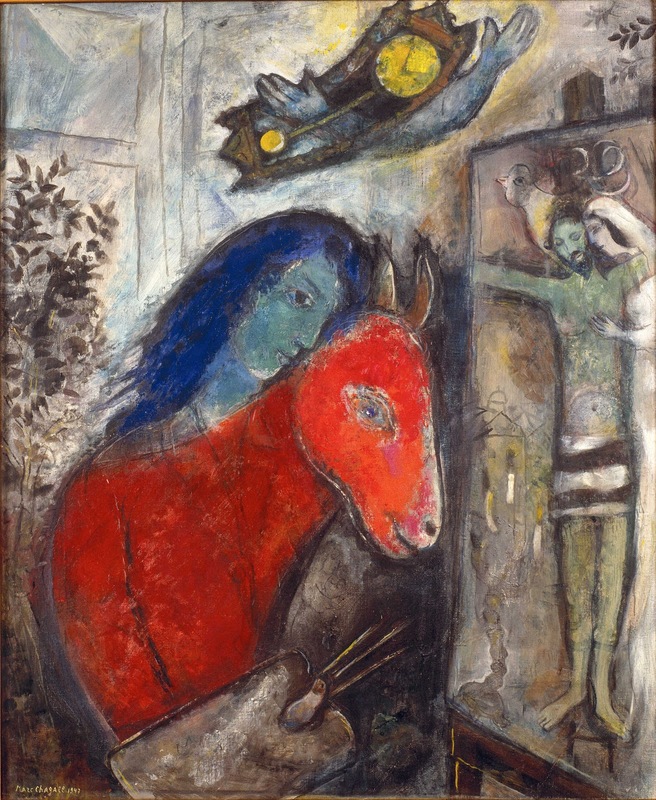 Throughout this interwar period Chagall traveled extensively, working in Brittany in 1924, in southern France in 1926, in Palestine in 1931 (as preparation for the Bible etchings), and, between 1932 and 1937, in Holland, Spain, Poland, and Italy. In 1931 his autobiography, My Life, was published. 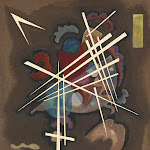 His reputation as a modern master was confirmed by a large retrospective exhibition in 1933 at the Kunsthalle in Basel, Switzerland. 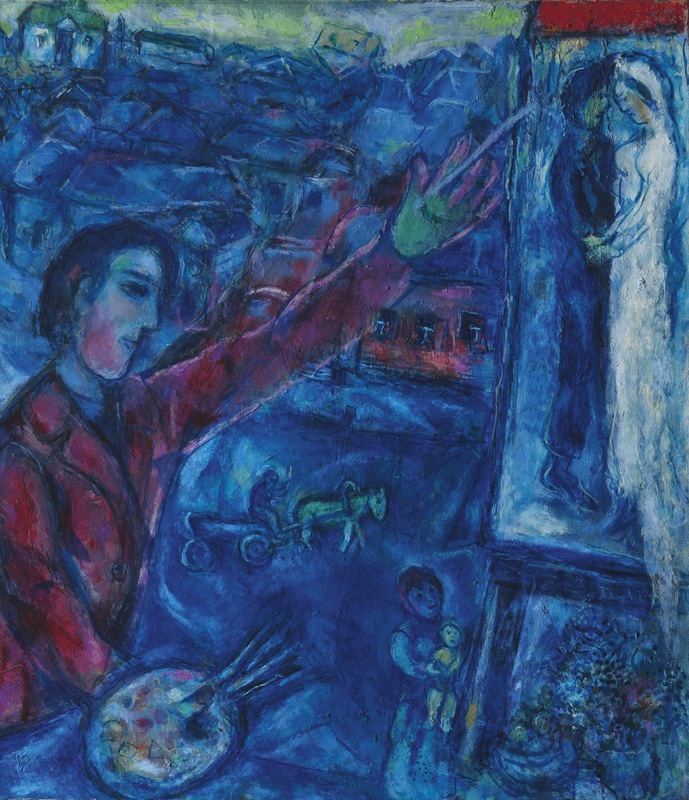 With the outbreak of World War II, Chagall moved to the Loire district of France and then, as the Nazi menace for all European Jews became increasingly real, further and further south. Finally, in July 1941, he and his family took refuge in the United States; he spent most of the next few years in and around New York City. 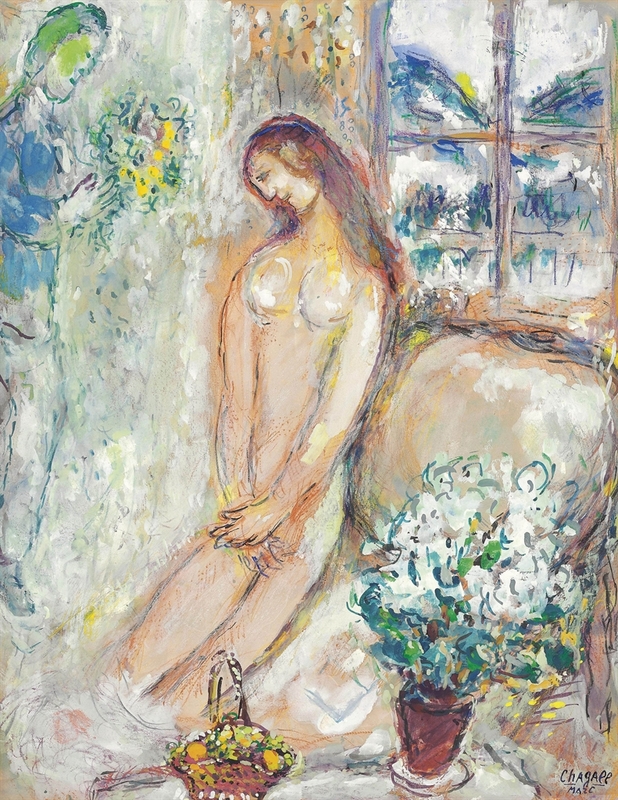 For a while Chagall continued to develop themes he had already treated in France; typical works of this period are the Yellow Crucifixion (1943) and The Feathers and the Flowers (1943). 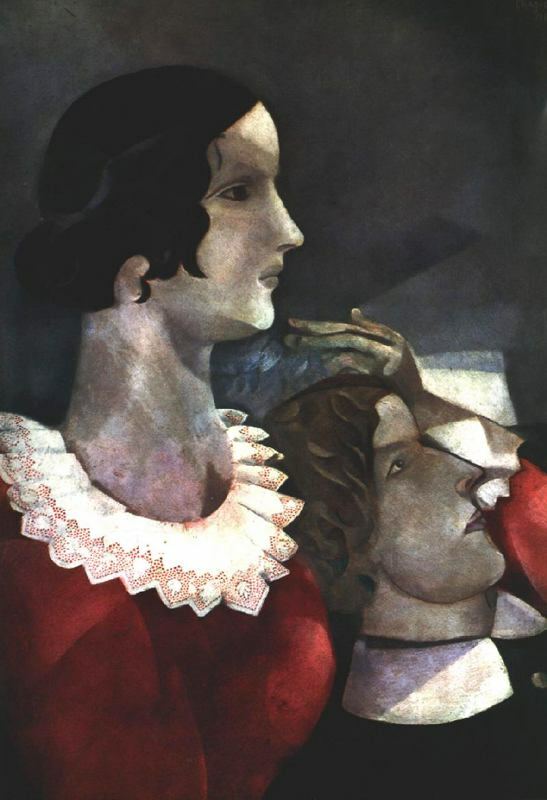 But in 1944 his wife Bella died, and memories of her, often in a Vitebsk setting, became a recurring pictorial motif. She appears as a weeping wife and a phantom bride in Around Her (1945) and, again, as the bride in The Wedding Candles (1945) and Nocturne (1947). 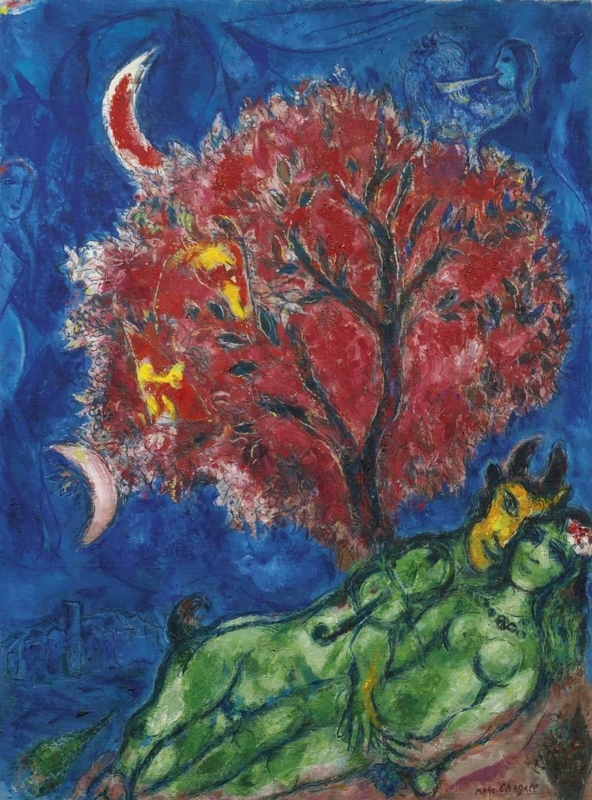 In 1945 Chagall designed the backdrops and costumes for a New York production of Igor Stravinsky’s ballet The Firebird. 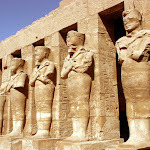 He was honoured with a large retrospective exhibition at the Museum of Modern Art in New York in 1946 and at the Art Institute of Chicago a few months later. 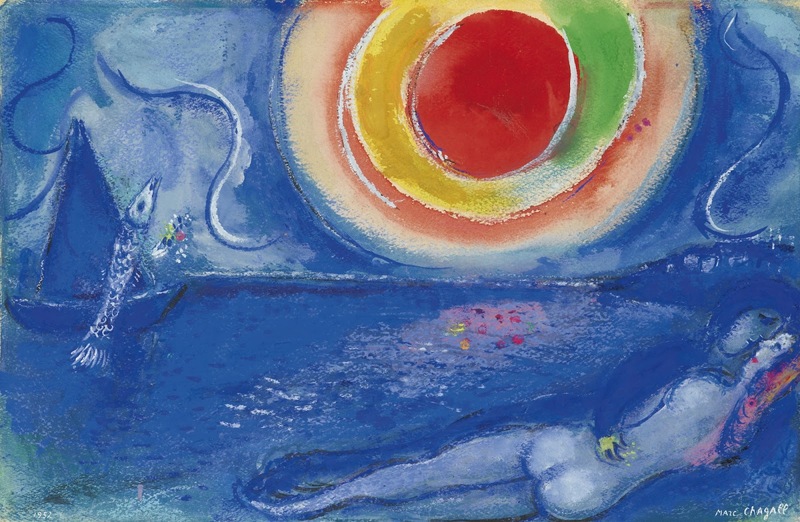 In 1948 Chagall settled again in France, first in the suburbs of Paris and finally on the French Riviera at Vence and nearby Saint-Paul. Between 1953 and 1956, without forgetting his native Vitebsk, he produced a series of paintings inspired by his affection for Paris. 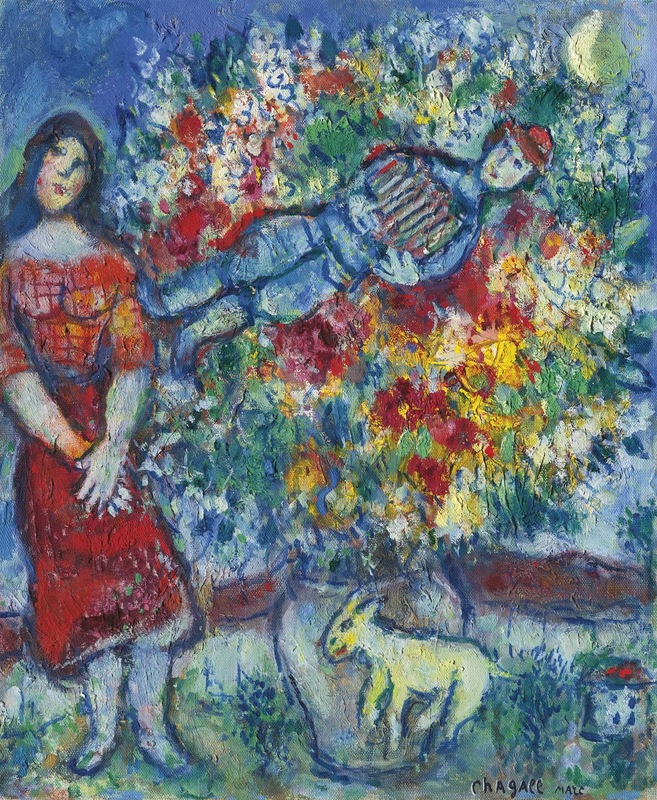 Chagall was prolific for the last 30 years of his life, continuing to paint on canvas while completing many large public projects in other media. He mastered the difficult art of stained glass in the late 1950s, and he designed a number of windows at international locations such as the Cathedral of Metz in France (1958-60), the synagogue of the Hadassah-Hebrew University Medical Center in Jerusalem (1960-61), the United Nations building in New York (1964), and the Art Institute of Chicago (1977). His stained-glass windows are often considered to be some of the strongest work of his late career; the medium’s capacity for brilliant colour was perfectly suited to his magical imagery. 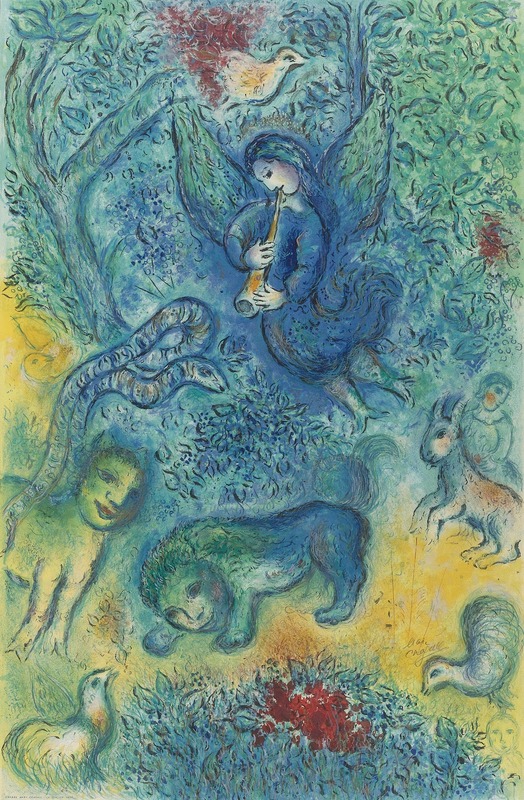 Chagall also remained involved in theatre design, completing a number of projects for the Paris Opéra and the New York Metropolitan Opera, including his highly regarded set and costume designs for the 1967 production of Mozart’s The Magic Flute. 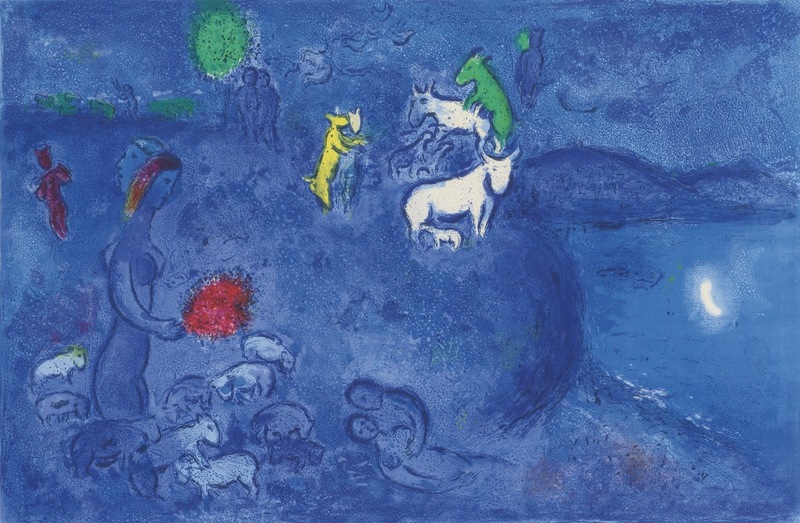 In 1973 the Museum of the Marc Chagall Biblical Message was dedicated at Nice, France, and in 1977 France honoured him with a retrospective exhibition at the Louvre in Paris. 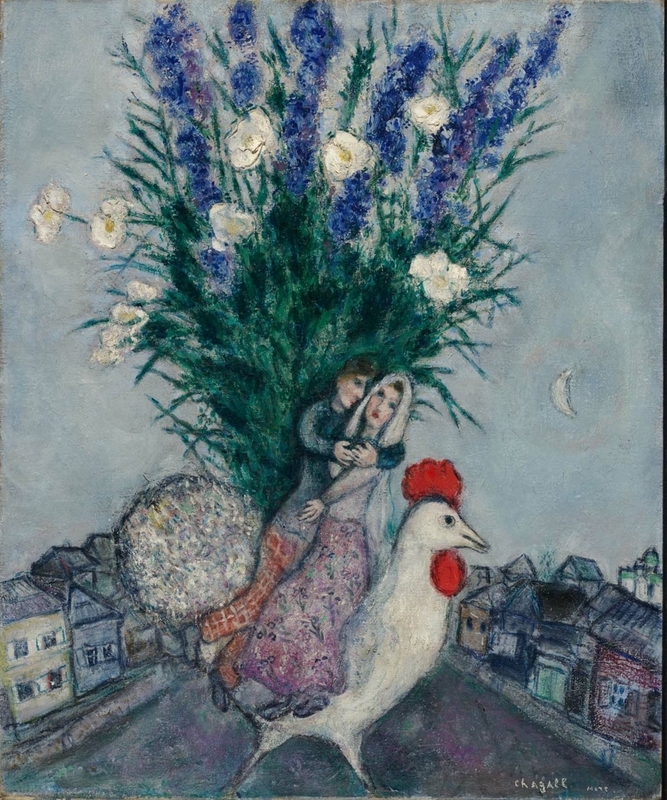 Chagall’s repertory of images, including massive bouquets, melancholy clowns, flying lovers, fantastic animals, biblical prophets, and fiddlers on roofs, helped to make him one of the most popular major innovators of the 20th-century School of Paris. 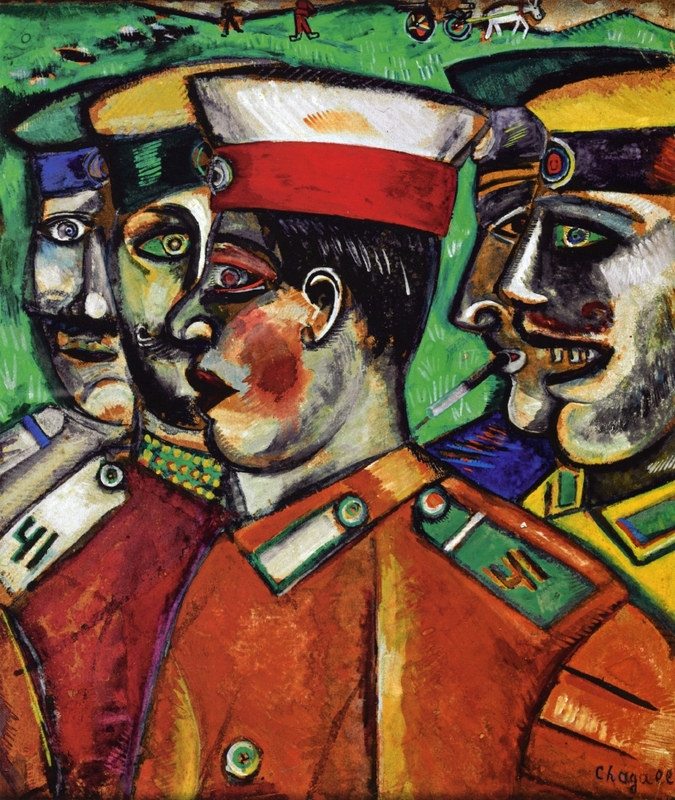 He presented dreamlike subject matter in rich colours and in a fluent, painterly style that-while reflecting an awareness of artistic movements such as Expressionism, Cubism, and even abstraction-remained invariably personal. Although critics sometimes complained of facile sentiments, uneven quality, and an excessive repetition of motifs in the artist’s large total output, there is agreement that at its best it reached a level of visual metaphor seldom attempted in modern art. 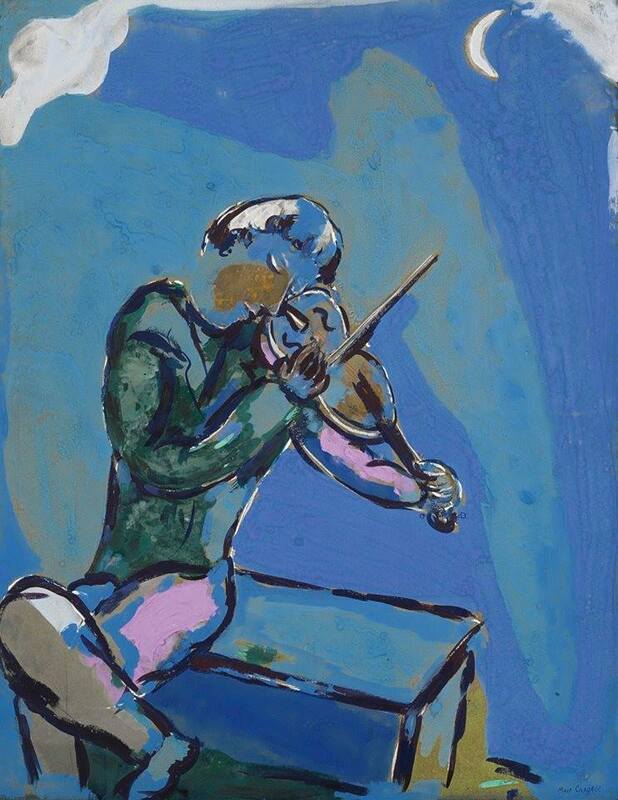 | Roy Donald McMullen © Encyclopædia Britannica, Inc.
Marc Chagall (Vitebsk, 7 luglio 1887 - Saint-Paul-de-Vence, 28 marzo 1985) è stato un pittore Bielorusso naturalizzato Francese, d'origine ebraica chassidica. Il suo vero nome era Moishe Segal (משה סג"ל - Segal è un cognome levita, acronimo di סגן לוי Segan Levi, "assistente levita"); il suo nome russo era Mark Zacharovič Šagalov, abbreviato in Šagal (Шагал; Chagall, secondo la trascrizione francese). 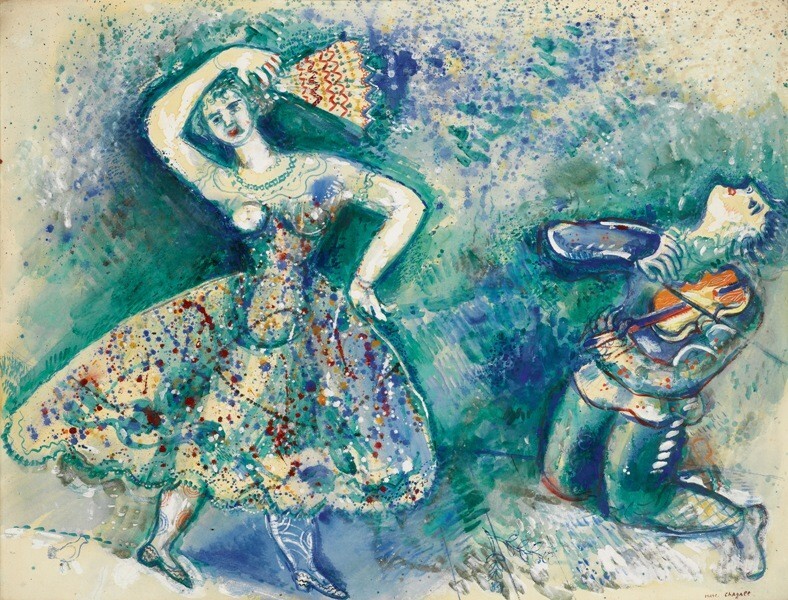 Marc Chagall nasce in una famiglia di cultura e religione ebraica, a Vitebsk (dove si parlava yiddish), allora facente parte dell'Impero Russo, oggi in Bielorussia. Il giorno stesso della sua nascita, il villaggio fu attaccato dai cosacchi durante un pogrom, e la sinagoga venne data alle fiamme; da allora, l'artista - rievocando le proprie origini - usava dire: "Io sono nato morto". Chagall fu il maggiore di nove fratelli. 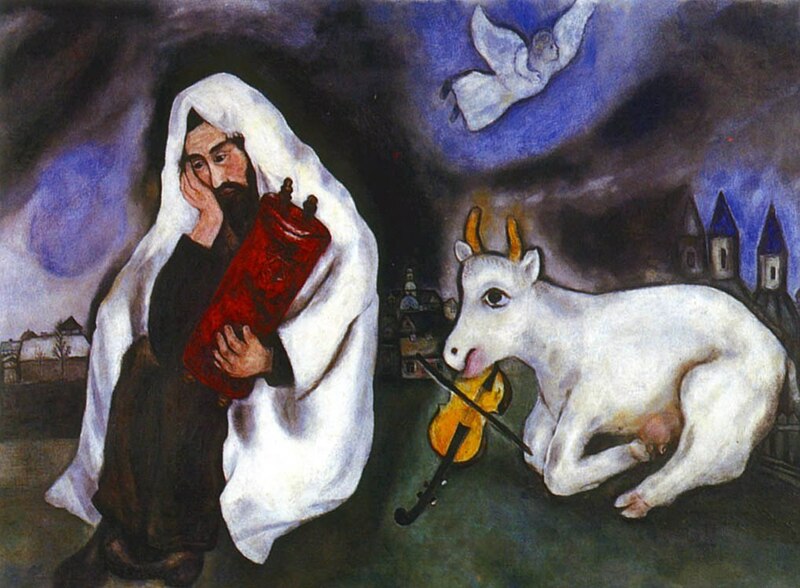 Il padre, Khatskl (Zakhar) Chagall, era mercante di aringhe, sposato con Feige-Ite. Nelle opere dell'artista ritorna spesso il periodo dell'infanzia, felice nonostante le tristi condizioni in cui vivevano gli ebrei russi sotto il dominio degli zar. Iniziò a studiare pittura nel 1906 con il maestro Yehuda (Yudl) Pen, il solo pittore di Vitebsk, ma l'anno successivo si trasferì a San Pietroburgo. Qui frequentò l'Accademia Russa di Belle Arti, con il maestro Nikolaj Konstantinovič Roerich e conobbe artisti di ogni scuola e stile. Tra il 1908-1910 studiò, invece, alla scuola Zvantseva con Léon Bakst. Questo fu un periodo difficile per lui: gli ebrei potevano infatti vivere a San Pietroburgo solo con un permesso apposito e, per un breve tempo, venne persino imprigionato. Rimase nella città fino al 1910, anche se di tanto in tanto tornava nel paese natale dove, nel 1909, incontrò la sua futura moglie, Bella Rosenfeld, figlia di ricchi orefici. Una volta divenuto noto come artista, lasciò San Pietroburgo per stabilirsi a Parigi, per essere più vicino alla comunità artistica di Montparnasse, dove entrò in amicizia con Guillaume Apollinaire, Robert Delaunay e Fernand Léger. Nel 1914 ritornò a Vitebsk e l'anno successivo si unì in matrimonio con Bella Rosenfeld. La loro prima figlia, Ida, nacque nel 1916. Nel 1917 prese parte attiva alla rivoluzione russa: il ministro sovietico della cultura lo nominò Commissario dell'arte per la regione di Vitebsk, dove fondò una scuola d'arte e il Museo di arte moderna di Vitebsk. Nella politica del governo dei soviet non ebbe tuttavia successo e per di più entrò in contrasto con la sua stessa scuola (in cui militava El Lissitzky) che per motivi politici era conforme al suprematismo, assolutamente agli antipodi dello stile fresco ed "infantile" di Chagall. Nel 1920 si trasferì con la moglie a Mosca, dove disegnò una serie di illustrazioni per il ciclo di poesie in yiddish "Grief" scritto dal poeta David Hofstein, anch'esso insegnante presso il rifugio Malakhovka. Si trasferì in seguito a Parigi nel 1923. 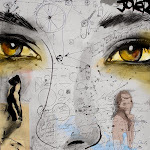 In questo periodo pubblicò le sue memorie in yiddish, scritte inizialmente in lingua russa e poi tradotte in lingua francese dalla moglie Bella; scrisse anche articoli e poesie pubblicati in diverse riviste e, postumi, altri scritti raccolti in forma di libro. Divenne cittadino francese nel 1937. 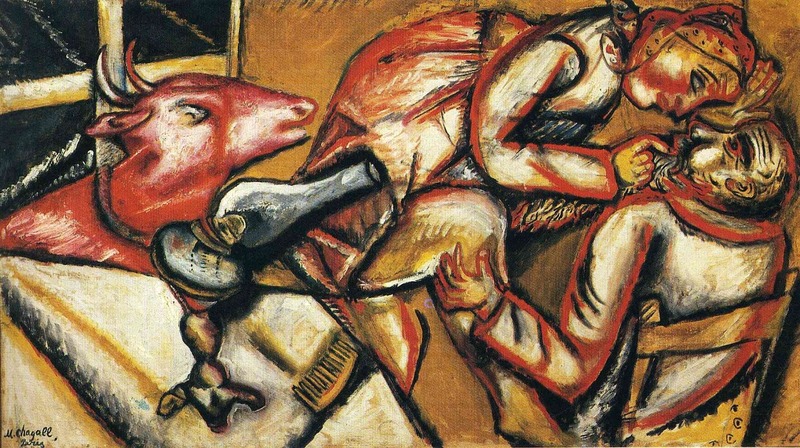 Durante l'occupazione nazista in Francia, nella Seconda guerra mondiale, con la deportazione degli Ebrei e l'Olocausto, gli Chagall fuggirono da Parigi. Si nascosero presso Villa Air-Bel a Marsiglia e il giornalista americano Varian Fry li aiutò nella fuga verso la Spagna ed il Portogallo. Nel 1941 la famiglia Chagall si stabilì negli Stati Uniti, dove sbarcò il 22 giugno, giorno dell'invasione nazista della Russia. Il 2 settembre 1944, Bella, compagna amatissima, soggetto frequente nei suoi dipinti e compagna di vita, morì per una infezione virale. 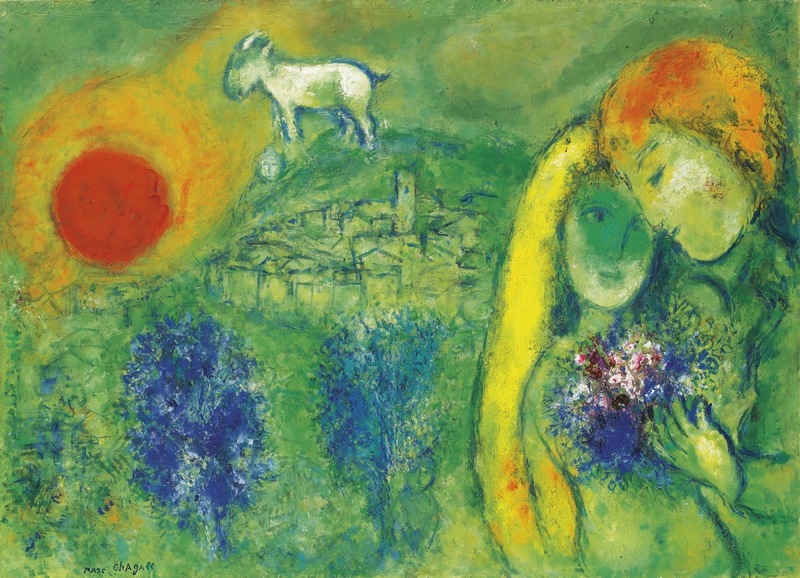 Due anni dopo, Chagall fece ritorno in Europa e nel 1949 si stabilì in Provenza. Uscì dalla depressione causata dalla morte della moglie, quando conobbe Virginia Haggard, dalla quale ebbe un figlio. Fu anche aiutato dalle commissioni che ricevette per lavori per il teatro. 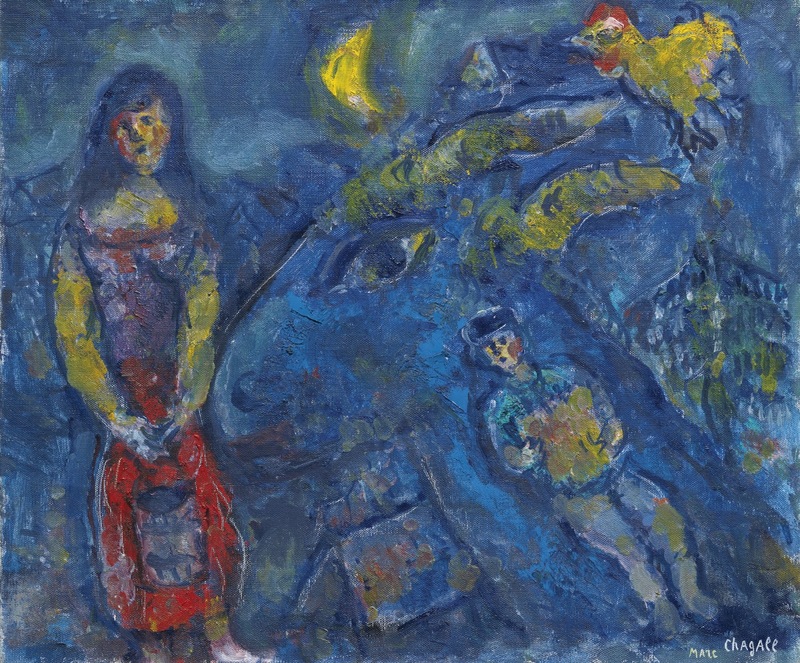 Chagall si risposò nel 1952 con Valentina (detta "Vave") Brodsky, anch'ella di origine russa ed ebrea, con la quale scoprì la Grecia. Nel 1957 si recò in Israele, dove nel 1960 creò una vetrata per la sinagoga dell'ospedale Hadassah Ein Kerem e nel 1966 progettò un affresco per il nuovo parlamento. Viaggerà anche in Russia dove sarà accolto trionfalmente, ma si rifiuterà di tornare nella nativa Vitebsk. Durante la guerra dei sei giorni l'ospedale venne bombardato e le vetrate di Chagall rischiarono di essere distrutte: solo una venne danneggiata, mentre le altre vennero messe in salvo. 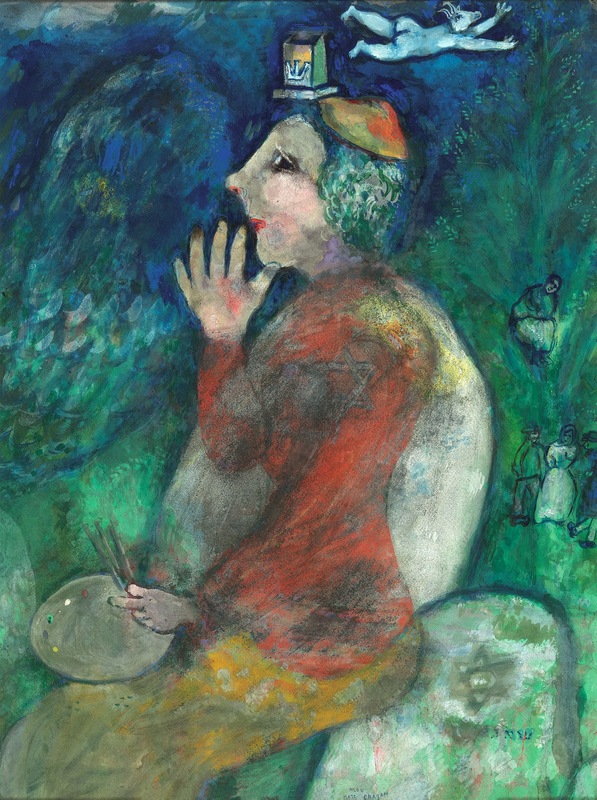 In seguito a questo episodio, Chagall scrisse una lettera in cui affermava di essere preoccupato non per i suoi lavori bensì per la salvezza di Israele, vista la sua origine ebraica. 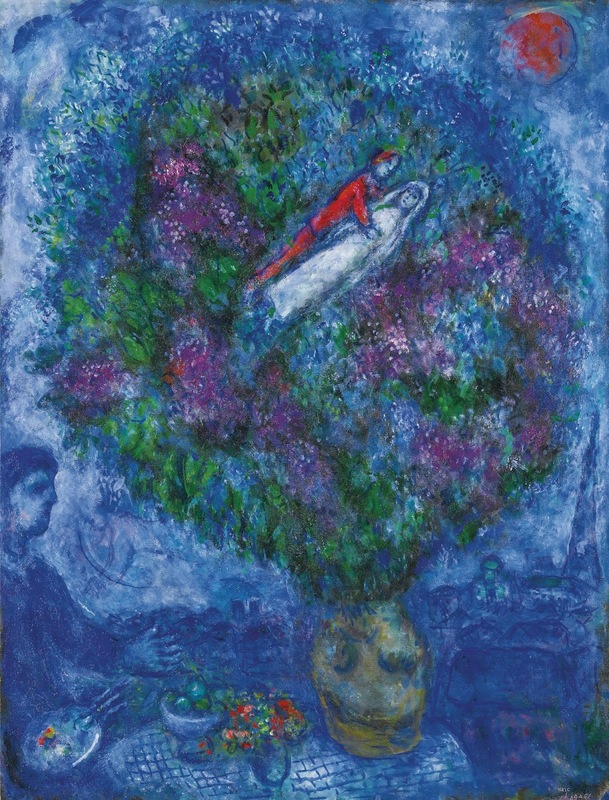 Chagall morì a 97 anni, a Saint-Paul de Vence, il 28 marzo 1985. 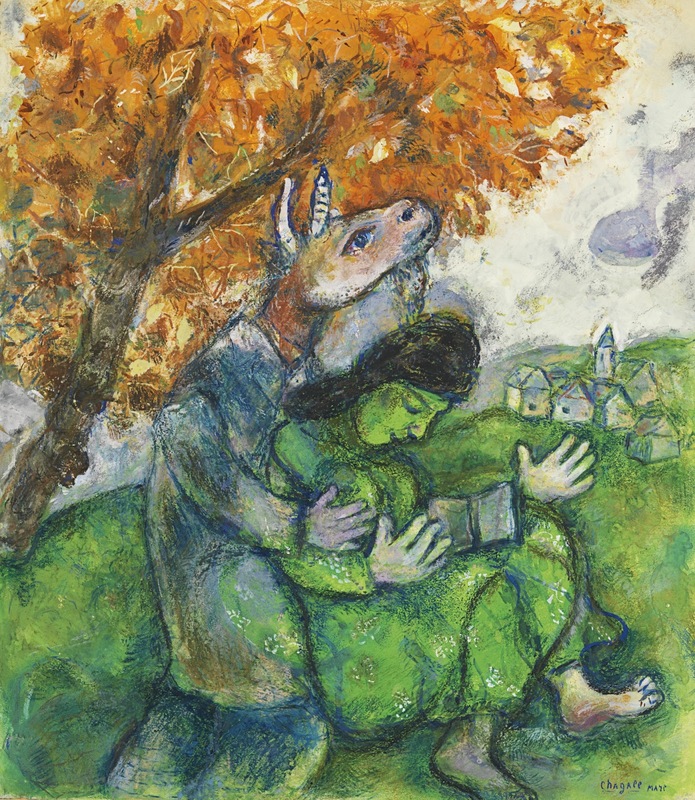 Chagall fu affascinato sin dagli anni giovanili dalla Bibbia, da lui considerata come la più importante fonte di poesia e di arte, ma è solo a partire dagli anni ’30 che se ne interessò profondamente ed iniziò a studiarla con dedizione. L’occasione per farne un lavoro giunse nel 1930, quando l’editore e mercante d’arte francese Ambroise Vollard, per il quale aveva già illustrato Le anime morte di Gogol e Le Favole di La Fontaine, gli commissionò una serie di tavole dedicate al tema biblico. 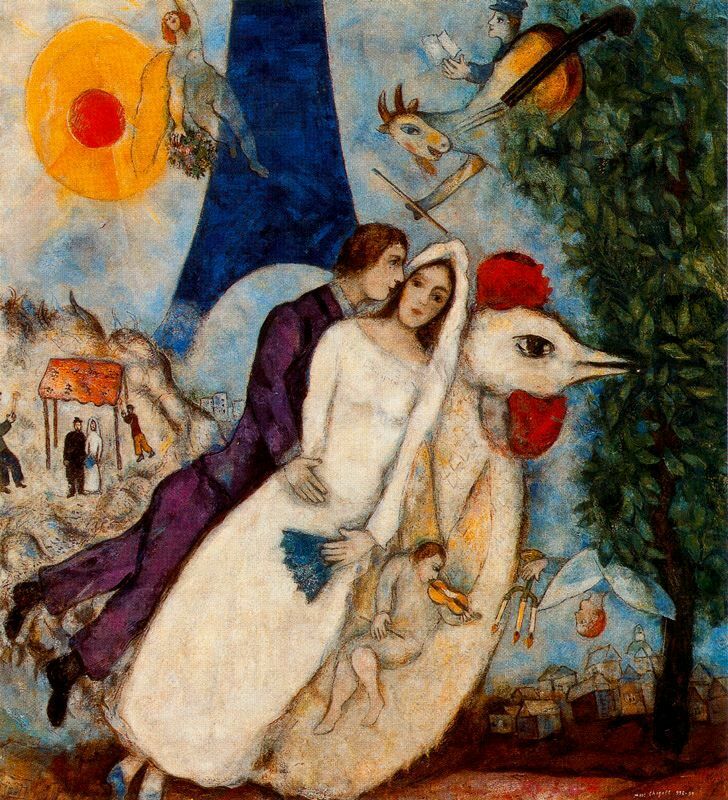 Chagall vi si dedicò con entusiasmo per tutto il decennio, tanto da intraprendere appositamente un viaggio sui luoghi delle vicende narrate dai Testi Sacri, tra Egitto, Siria e Palestina: da questo momento in poi, la Bibbia occuperà l’intera produzione artistica dell’autore, che ne fornirà un’interpretazione pur mediata dall’influenza delle avanguardie francesi.